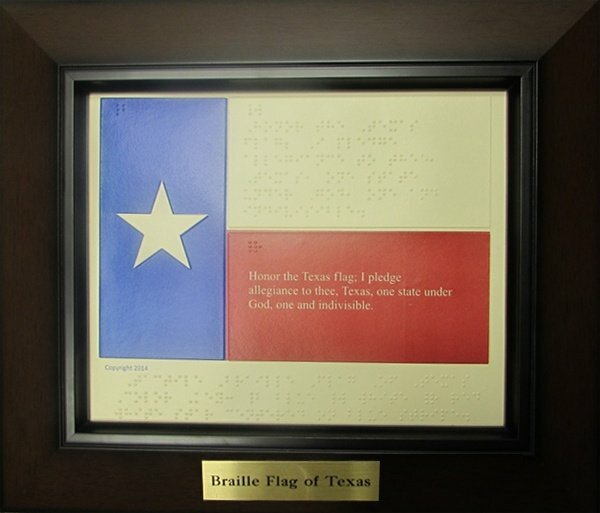 Each flag is carefully constructed from Braillon, a polyethylene material noted for durably retaining Braille and tactile graphics. 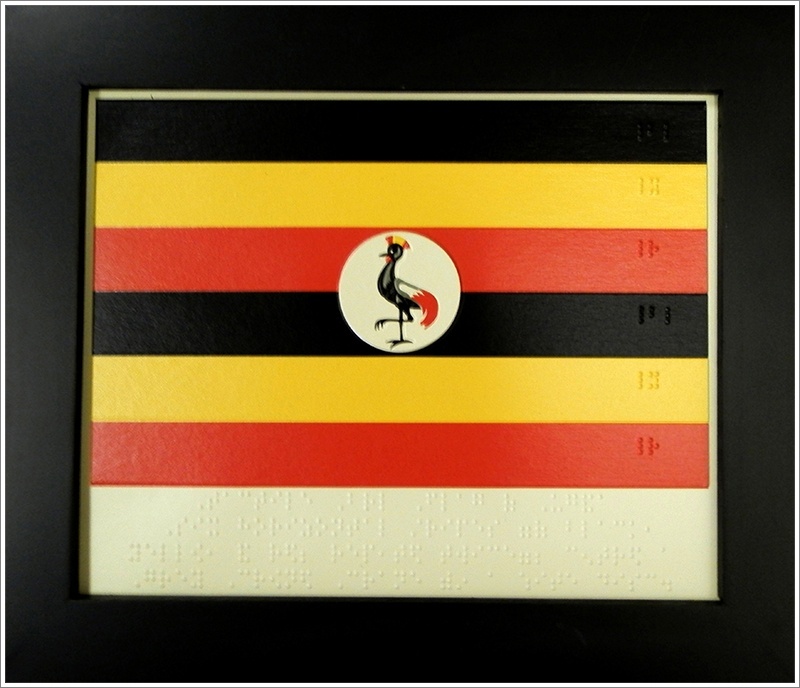 Framed or otherwise, you will be proud to display your fully tactile Braille flags. All tactile flags should be displayed indoors only. 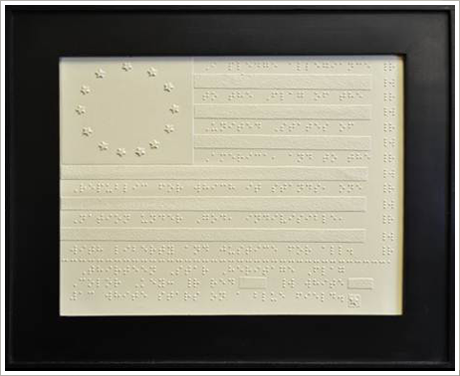 These tactile graphic can serve as valuable educational aids for teaching blind elementary school students how the United States flag and other flags are designed. They are also easily handed out as demonstration pieces at conferences, workshops, or seminars. Many copies have been donated to local veterans' hospitals and organizations, schools, churches, museums, libraries, and civic groups, and for memorial use. Prices listed include shipping and handling, unless customers request expedited shipping, which incurs additional fees. International orders may also incur additional fees. 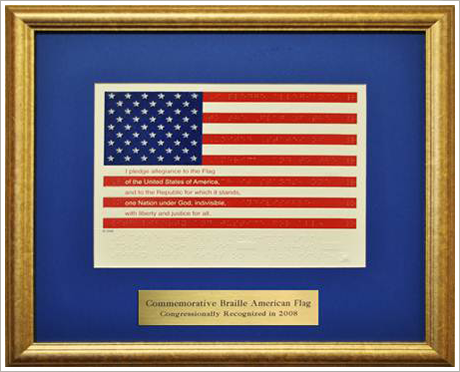 Special pricing for framing your Braille flag including a bronze label is: $25.00. Inquire about shipping as it may be extra. This fully tactile graphic depicts the current fifty-star United States flag in full color. The embossed tactile figures on the left hand side are the stars, each of which represents one of the current fifty States; the stars are white on a blue canton. The long tactile horizontal red stripes on the right are labeled with the lower case "r" at the far right end. Between each of the red stripes are horizontal white stripes, which are labeled with the lower case "w" at the far right end. There are thirteen stripes, which represent the thirteen British colonies in North America, which became the first states of the newly independent republic after the American Revolution. The pledge of allegiance is displayed in large print over the red and white stripes, in alternating red and white lettering, and is also written in standard-font English literary Braille code on the red stripes. Immediately beneath the flag is a "key" in English literary Braille code. Flag measures 7.5" x 9.5". This graphic depicts the State Flag of Texas. The state flag is a rectangle that has one blue vertical stripe, two equal horizontal stripes, the upper stripe white, the lower stripe red, and one white, regular five-pointed star located in the center of the blue stripe. The upper right hand corner of each stripe is embossed with the Braille dots, 4,5,6 followed by the lower case letters “b” for blue, “w” for white, and “r” for red. Centered in the blue vertical stripe is a raised five-pointed star. 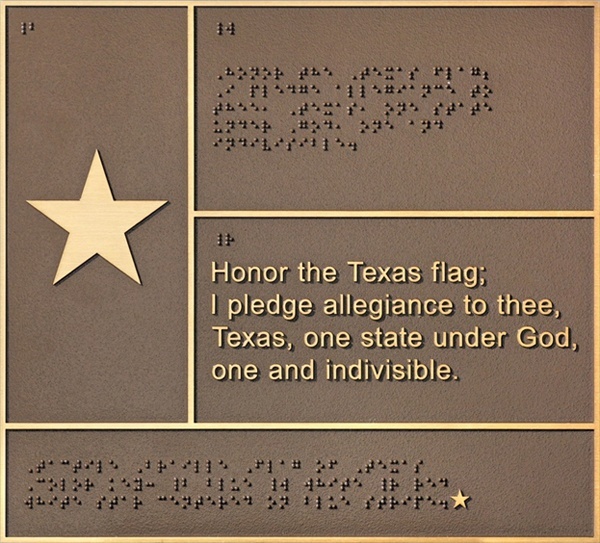 The Texas Pledge Allegiance is embossed in standard font English literary Braille code within the upper white stripe. Flag measures 7.5” x 9.5”. This fully tactile graphic depicts the current fifty-star United States flag. The embossed tactile figures on the left hand side are the stars, each of which represents one of the current fifty States. The long tactile horizontal lines on the right represent the red stripes and are labeled with the lower case "r" at the far right end. Between each of these tactile representations of the red stripes are the long smooth areas or "white space" representing the white stripes of the flag and are labeled with the lower case "w". There are thirteen stripes, which represent the thirteen British colonies in North America, which became the first states of the newly independent republic after the American Revolution. 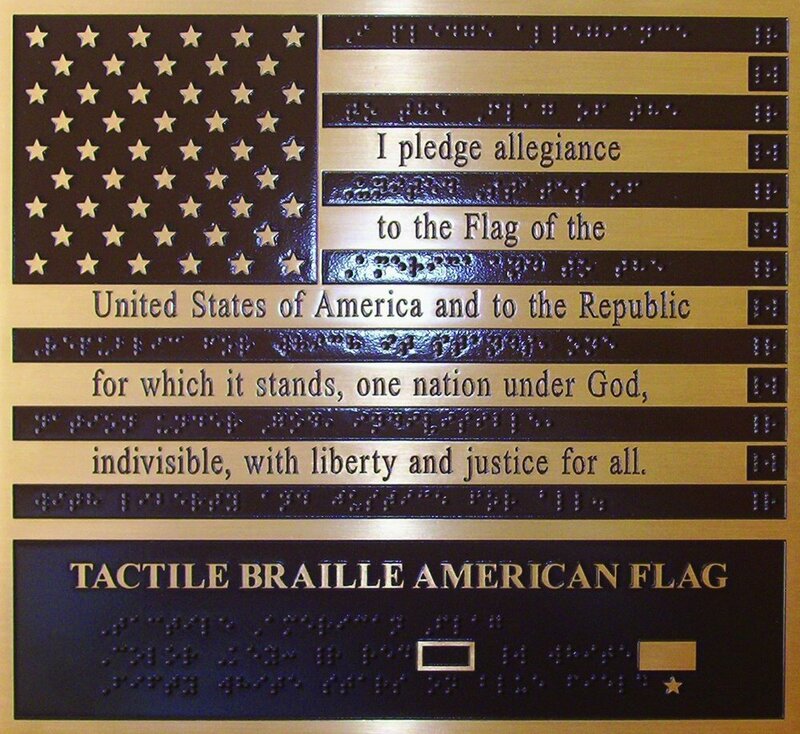 The pledge of allegiance is written in standard-font English literary Braille code over the raised red stripes. Immediately beneath the flag is a "key" in English literary Braille code. Flag measures 7.5" x 9.5". This fully tactile graphic depicts the historical flag flown by the thirteen British colonies in North America, which became the first states of the newly independent republic after the American Revolution. The embossed tactile figures on the left hand side are the stars, each of which represents one of the original thirteen colonies and are arranged in a circle. The long tactile horizontal lines on the right represent the red stripes and are labeled with the lower case "r" at the far right end. Between each of these tactile representations of the red stripes are the long smooth areas or "white space" representing the white stripes of the flag and are labeled with the lower case "w". There are thirteen stripes, which also represent the colonies. The pledge of allegiance is written in standard-font English literary Braille code over the raised red stripes. Immediately beneath the flag is a "key" in English literary Braille code. Flag measures 7.5" x 9.5"
Marine CorpsFlag (non-color): This fully tactile graphic depicts the flag of the United States Marine Corps. The main image on the flag is an embossed reproduction of the Marine Corps emblem, with a banner below bearing the embossed text "United States Marine Corps." Immediately beneath the flag is a "key" in English literary Braille code. 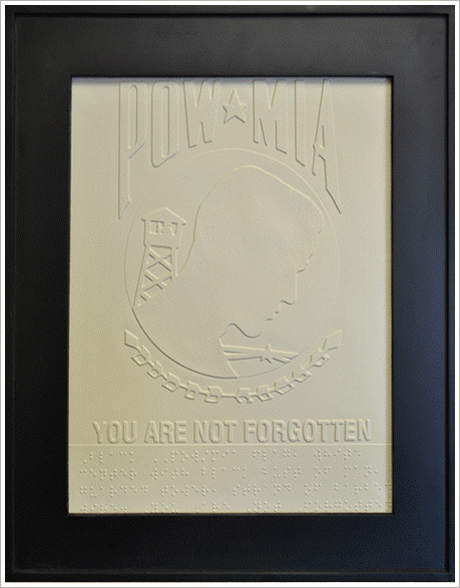 Flag measures 7.5"x 9.5"
POW-MIA Flag (non-color): This fullytactile graphic depicts the Prisoners of War/Missing in Action flag, originally developed by the National League of Families. The main image on the flag is an embossed reproduction of the POW-MIA flag. Immediately beneath the flag is a "key" in English literary Braille code. More information about the POW-MIA flag can be found at the website of the U.S. Department of Defense Defense Prisoner of War/Missing Personnel Office. Flag measures 7.5" x 9.5"
Add $30.00 for all shipping and handling, and allow 4 weeks for delivery. 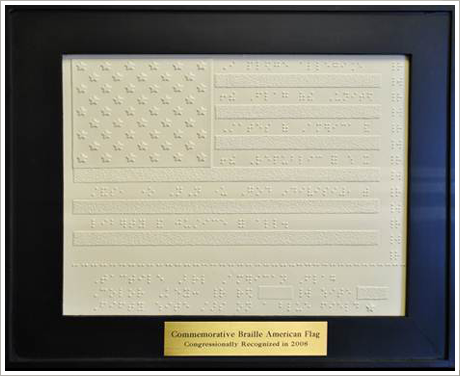 Flash Bronze Braille American Flag: The Flash Bronze American Braille flag is designed for permanent indoor display only. The flag measures 13.25" by 12” and weighs 7.5 lbs. Flash Bronze Braille Flag of Texas: The Flash Bronze American Braille flag is designed for permanent indoor display only. The flag measures 13.25" by 12” and weighs 7.5 lbs. 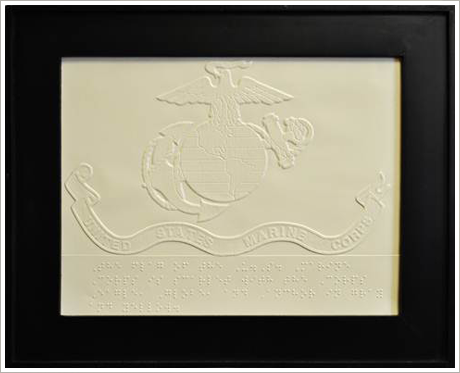 Braille Flags autographed by Martina McBride (non-color): These Braille flags were autographed by award-winning country music star Martina McBride. A native of Sharon, Kansas, McBride is a four-time winner of the Country Music Association's Female Vocalist of the Year award. She has won the Academy of Country Music's Female Vocalist of the Year award three times, and is also a 14-time Grammy Award nominee. Flags measure 7.5" x 9.5". 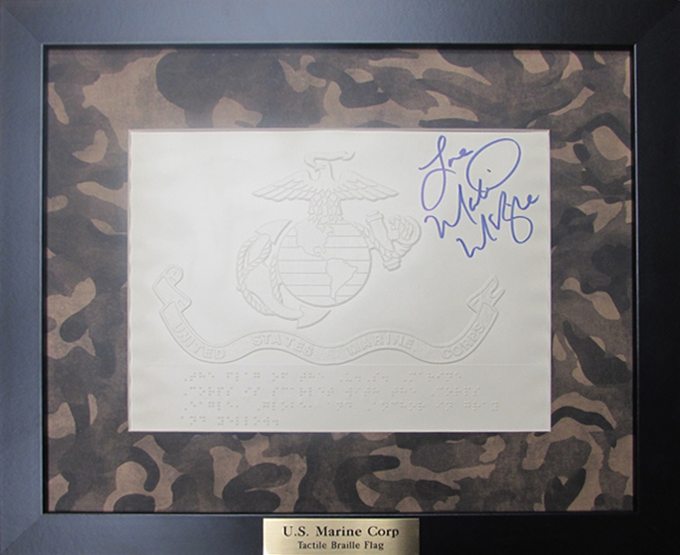 Contact us about our framed Martina McBride autographed Braille Marine Corps, POW, 13 Star Heritage, and 50 Star American Flags for more information. 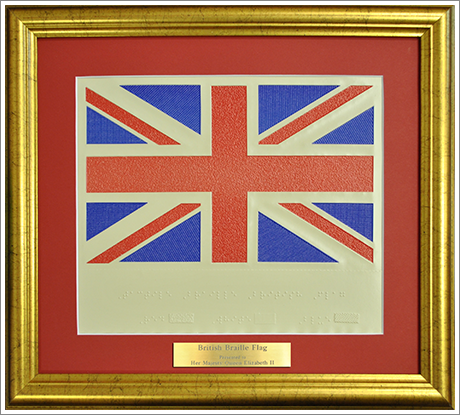 British Flag (color): This fully tactile graphic depicts the current flag of the United Kingdom, commonlyknown as the Union Jack. The flag incorporates three crosses, red on white(St. George's, for England), blue saltire on white (St. Andrew's, forScotland), and red saltire on white (St. Patrick's, for Ireland). 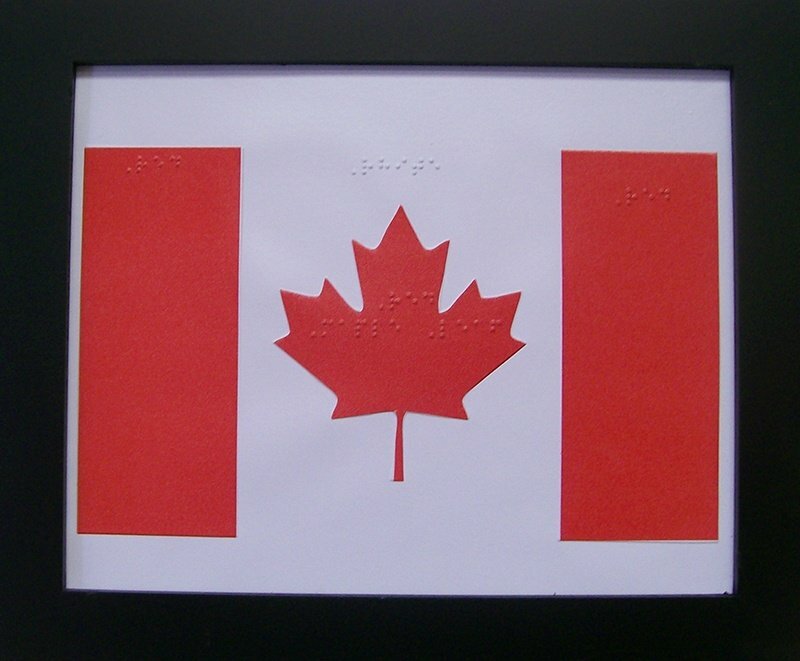 Flagmeasures 7.5" x 9.5"
Canadian Flag: Thisfully tactile graphic depicts the current flag of Canada. The flag incorporatedtwo red stripes on either side of a white stripe, with a red maple leaf in thecenter. Flag measures 7.5" x 9.5". Braille Writer: KBTI now offers manual and electric Perkins Braille Writers for sale. The Braille Writer is a typewriter for the blind, manufactured by Howe Press at the Perkins School for the Blind, Watertown, MA. Please note that prices may vary according to particular Braille Writer models available. 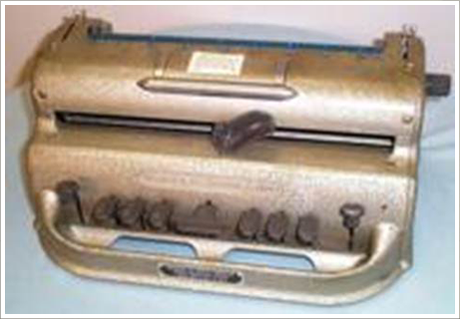 Purchase of a Braille Writer from KBTI includes one free maintenance check within a calendar year from date of purchase. Browse our selection of books for sale.